This all purpose stem and waterproof crown lubricant is clean and stable and provides durable lubrication. The melting point is 450'F. D-5 is a standard in the watch industry. A heavier lubricant, D-5 is often specified for barrel pivots, automatic winding system components, and some of the train wheels (usually center and third). 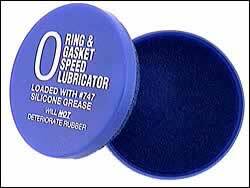 This is a lubricant every watchmaker should have. Twenty milliliters in glass bottle. Moebius 8200 grease is sometimes specified for mainspring barrels and is a long-time standard product in the industry, particularly for handwind watches. 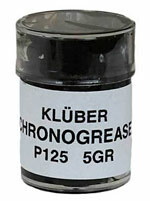 It can also be used as a stem and winding gear lubricant grease on many older watches. My recommendation would be to use Moebius 8141 in most applications instead. The particular application should dictate the oil. Moebius 941 developed for pallet jewels of mechanical movements is now also recommended by ETA for use on high grade quartz movements. Moebius 941, has a higher degree of oiliness than conventional synthetics and is rated a fine oil while 9415 is rated as a grease. 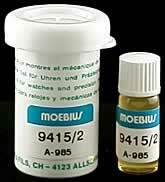 Moebius 941 for pallet stones and pins for watches 5 1/2 ligne up a pocket watches. Also use Moebius 941 on Escape Wheels for the same size watches. Special synthetic mineral lubricant which is recommended by Ebauches SA and the Swiss Horological Research Laboratory. 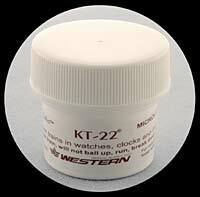 Excellent quality suitable for high friction over wide temperature range, -50 to 100C, on copper alloy parts in today high grade Quartz Watches. 10 grams. For friction with carbon alloy 10 grams. A white homogeneous grease for lubrication of mechanical parts used in temperature range -30 degree to +150 degree celcius. Specially developed for parts subject to friction of medium pressure when mineral and standard synthetic lubricants break down due to temperature changes and exposure to the air. Also useful of greasing all types of joints as well as special optical and micro mechanical equipment. 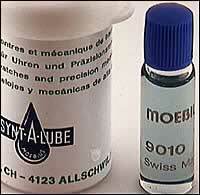 Moebius Synt-HP 1000 is a high pressure oil with the viscosity of 1000. The excellent ageing stability ensures a constant viscosity over a long time. High pressure resistance as well as a superior lubricating and adherence capacity. For use on mechanical watches' gear train, barrel-arbor, steel/steel frictions-partners; as well as for board instruments, micromotors, mini-ballbearings, etc. The recommend shelf life of this product is 6 years. 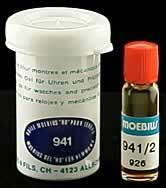 Moebius Synt-HP 1300 is a high pressure oil with the viscosity of 1300. The excellent ageing stability ensures a constant viscosity over a long time. High pressure resistance as well as a superior lubricating and adherence capacity. For use on mechanical watches' gear train, barrel-arbor, steel/steel frictions-partners; as well as for board instruments, micromotors, mini-ballbearings, etc. Moebius Synt-HP 1300 is a high pressure oil with the viscosity of 1300. The excellent aging stability ensures a constant viscosity over a much long time than natural oils like D-5 or 8141. High pressure resistance as well as a superior lubricating and adherence capacity, allows for use in places where Synthetic Oil 9020 is not appropriate to use . 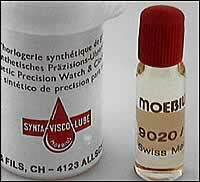 ETA now recommends Moebius 9104 Synthetic Oil Synt-HP 1300 for use on the 2801-2, 2804-2, 2824-2, 2836-2 mechanical watches for the gear train, barrel-arbor, steel/steel frictions-partners; as well as for board instruments, micromotors, miniature ball-bearings, etc. Excellent grease used to lubricate the inner walls of the barrel. Black in color. New Synethetic Grease, ideal for friction problems, recommended by ETA for new models. 10 ml syringe.